Yesterday, Zimbabwe’s current leader Robert Mugabe returned home from Singapore. 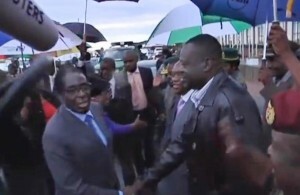 After his arrival in Harare he dismissed rumors about his state of health. Media reports had been stating that the 88 years old leader had been fighting for life in a Singapore hospital. Immediately after his return, Mugabe chaired a cabinet meeting in Harare that had been moved from Tuesday to Thursday because of his absence. According to Reuters reports, he has been seen joking with Vice President Joice Mujuru at the airport. As you can see, he is fit as a fiddle. Why do we spread rumors? It’s all lies told by a press driving an imperialist agenda!